"Just a little something extra to warm the change of seasons. Wonderful aroma. Try using one of these varieties: Granny Smith, Spys, Cortlands, or Pippins." In a large bowl, combine apples, lemon juice, sugars, spices, flour, butter, and caramels. Stir to coat fruit evenly. Roll dough out, and cut out two crusts. Line a pie plate with one of the crusts. Spoon filling into the bottom crust, and cover with the top crust. Crimp the edges. Place the pie on a baking sheet covered with foil. Poke fork holes over top. Sprinkle lightly with granulated sugar. Bake at 375 degrees F (190 degrees C) for 50 minutes. If you notice overbrowning after 30 minutes, reduce heat to 350 degrees F (175 degrees C). Serve warm, or at room temperature. This pie is now a favorite. Only suggestions are to reduce white sugar by 1 or 2 TBL. (caramel & 2 kinds of sugar made it overly sweet) and also reduce butter to 2 or 3 TBL. I just made this without the crust, baked in a 13x9" pan. My 6 year old told me it tasted like an "inside-out caramel apple." I served it over vanilla ice cream and it was a HUGE hit. Thanks! This pie is excellent! I used Granny Smiths, decreased the sugar a bit, added extra carmels (that melted just fine). This is the pie I will take for all holidays! You must try this! 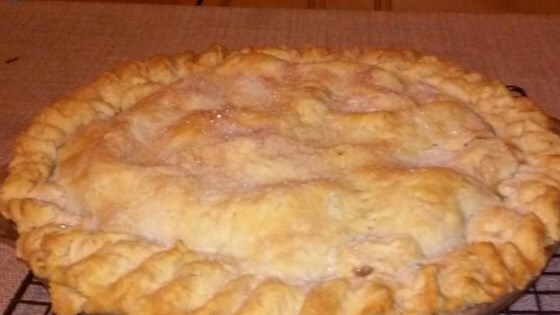 This is an excellent apple pie recipe!! The only change I will do the next time I make this pie is that I will add a little more flour to the mixture...my pie came out a little runny.